Benefits of Massage: Massage can Help! The Many Benefits of Massage - How massage can help! Massage can really help with many things -First is of course back and neck pain. That is what it is really known for. Today with so many people working on computers and sitting at desks all day, massage can work wonders with the pain and stiffness that happens on a daily basis. Our bodies were meant to move and not sit all day. When we sit staring at computers and with so much stress in our jobs and lives, it can be challenging for anyone to remain pain free. The pain and stiffness that results not only affects our bodies, but also our minds and overall health. When you are in pain and under stress, your ability to think straight is affected. The nagging pain can distract you and keeps you from focusing fully on the task at hand - your job! Getting regular weekly massage can help you keep your focus as well as keep you out of pain. Most of my clients will say things like "I came in with neck pain and left feeling happier. My coworkers and partner also thought I was nicer and more relaxed!" Massage is also very effective for things. Carpal tunnel syndrome/hand, wrist or forearm pain. Carpal tunnel is caused by over use on the keyboards, tablets and computer games. It usually is a result of tight muscles that occur from repetitive use of the hands/forearms. Massage can help to reduce that tightness along with the triggerpoints and help avoid surgery. Hip/knee pain can be relieved with massage. Most hip/knee pain is usually related to the tight muscles around the hips including the leg muscles such as the hamstrings and quadriceps. Pulled muscles from athletics or just something that 'tweaks' a muscle is usually related to tight muscles in other places in the body. It is necessary to relive that tension and also work on the injured area to speed up healing. 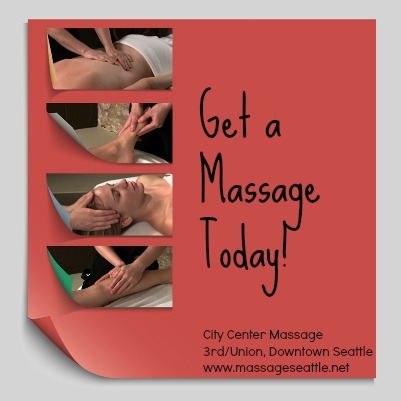 Massage can help pulled muscles heal because of the increase in circulation and reducing the triggerpoints in the area. Herniated discs can be caused by tight muscles or an injury such as a car accident or other sports injury. Discs in the low back are usually able to return to normal when the muscle tension is relieved in the psoas muscle and hip rotator muscles. The discs in the neck usually have to do with the muscles of the neck and back but they can also be caused by the mis-alignment of the pelvis and the tightness of the surrounding muscles there. Headaches especially tension headaches can be helped by releasing the tension in the neck and upper back in particular. It is important to check head/neck posture when sitting at the computer to help reduce the tension. Fibromyalgia is characterized by pain and tenderpoints. Massage can often help reduce the symptoms and help you recover from this condition. Massage can also really help with many other diseases and conditions.